If you love the action from UFC, you do not want to miss the chance to own this collector series of UFC action figures. Each pack comes with a ~6″ figure featuring a fighter from the Ultimate Fighting Championship. With multiple points of articulation, each figure can be adjusted to their signature fighter poses with authentic fight worn shorts. NOTE: Due to the unique design of each figure, the sizes of the figures may be slightly bigger or smaller than stated. 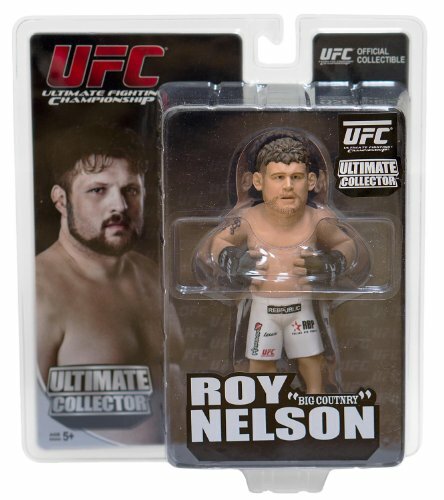 If you love the action from UFC, you do not want to miss the chance to own this collector series of UFC action figures. With multiple points of articulation, each figure can be adjusted to their signature fighter poses with authentic fight worn shorts. The package also includes fighter photos and bios.